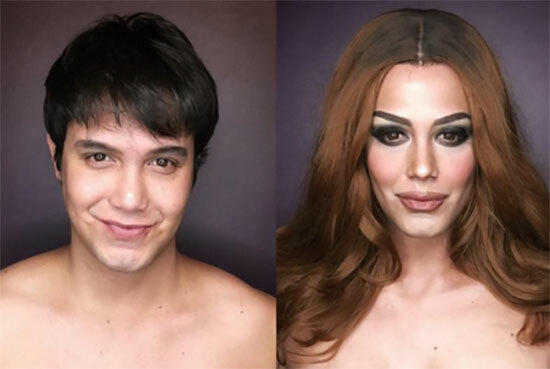 The Eat Bulaga co-host and popular make-up transformation expert Paolo Ballesteros showed his new face transformation this 2016. He made his face look alike Miss Colombia Ariadna Maria Gutierrez Arevalo. Paolo posted his transformation photo on his Instagram account with a character name, "ARIADNA GUCHENEZ". According to the news, a week after the controversial mix-up on Miss Universe 2015 where the host Steve Harvey mistakenly read the wrong winner instead of our Philippine's pride Ms. Pia Wurtzbach, the 33-year-old Ballesteros started doing his make-up transformation as Miss Colombia. Since 2014, Paolo gained his popularity on make-up transformation after he copy the faces of those international and local well-known female artists like Marian Rivera, Taylor Swift and Julia Roberts. By then he became an instant hit to all his Instagram followers and other social media users. And now, even the real Miss Colombia Ariadna Maria Gutierrez Arevalo expressed her reaction to the make-up transformation photo of Paolo. Miss Colombia said, "Omg.. love it," Ms. Ariadna Maria Gutierrez Arevalo admired Paolo on his talent. As of writing, the photo was uploaded yesterday, January 9 and has already 47.5K likes and 1,609 comments. Comments or suggestions about "Paolo Ballesteros transforms into Miss Colombia Ariadna Maria Gutierrez" is important to us, you may share it by using the comment box below.